Swordfish Islands: 3d6 - Oh Yeah! Turns out this is the 200th post on this blog. Let us take a moment to celebrate round numbers. Now that that's over with, let's talk about stuff I'm excited about! There's no plot in the Swordfish Islands and no monsters are keyed to rooms in dungeons. The world trundles on along, intelligent factions precariously balanced, oblivious to your gaming group's adventuring party. Your group isn't special. The world doesn't revolve around it, and monsters don't spring into existence, fully formed from the ether, every time someone opens a door. Location - This can be a dungeon, a village, a city, a structure, a quarter, a level, an enchanted grove, whatever. The key point is that you need a physical space, differentiated from other physical spaces in some way, that changes on a slow timeline. I almost wrote that as a "fixed" place, but a flying city that moves about the world is just as good as a traditional stuck on the ground city. Two Tables, Three Columns, 3d6 - Once you've got these ideas you make two, 3d6 tables. The first table has just one column, the second has two. Making them as 3d6 is critically important because of the built in bell curve associated with the results. 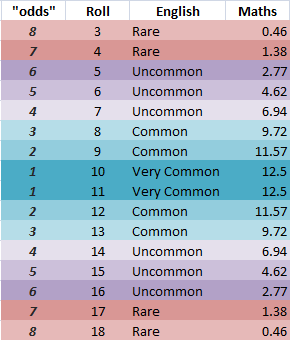 The odds work out in such a way on a 3d6 table that you have "Very Common", "Common", "Uncommon" and "Rare" results. The way I think about is, very common and common are things that are going to happen in this location. Uncommon represents things that may occasionally occur and are a great place to put things that will occasionally "pass through" this location. Rare is where the "this might happen one day" stuff goes. What's even cooler is that these odds are symmetrical so, going back to the market example I roughed out above, you could put things dealing with the cult on one half of the table, and things dealing with the gypsies on the other half in a place with equal odds. Table 1: What's Happening - For this first table you want to write out quick, evocative, "big picture" things that are happening in this location when the party arrives. It's possible for these things to be relatively specific, but the consequences of the detailed actions/events should be felt throughout the entire area. For example, in my opinion, a market has a relatively binary core. It's either open for business, or closed, so for 10 and 11 I'd put something like "The market is open and bustling with activity" and "Market day's tomorrow. All the stalls are locked up and shut tight." The "What's Happening" table is the only table where I'd mention the "named NPCs". They'd usually go in the rare spots, but not always. For example, in the common spots 8 and 13 for this market I'd put "Allie is leading a group of church ladies through the market to hand out bread to orphans" and "Brindle is making his rounds to pick up the day's 'cut' from the merchants he provides with 'protection'". Then in the rare's I'd put something like "Part of the market burned down last night (drop dice on map to determine damaged areas). Guards investigating, Tammy and Rex totally did it"
The uncommons are where I'd put "theme days" for the market. Maybe something like "Market's closed! Too many alligators in the streets today." Or "The bardic college of Moist Sighs has set up a checkered tent and is recruiting today". Or "Today is the feast of St. Cuthbert. The market has been repurposed for a city wide feast and parade." These are all transient things that probably happen a few times a year. Don't neglect non-obvious things too. It could be a normal market day, but the gypsies are moving slaves through in wine barrels, or the cult could be holding a planning meeting for an upcoming ritual. Even though these are "secret" events they have a direct impact on the way things are going to occur in the market today. The tailor's shop may be closed for the cult meeting and there's an increase in the number of sedan chairs moving through the area. The slave trade may attract weird foreigners with heavy purses and accents and Brindle may be on edge and miss his normal pickups. Table 2: Encounters/Motivation - This is a two column table. Your encounters have *got* to have a motivation. They're going about their life, doing their own thing. Their motivation may (and probably will) encourage them to interact with your party, but it doesn't have to. Additionally, the motivation is critically important at setting up the feel of the place because of the way it interacts with the 3d6's bell curve results. If you want to make a place dangerous, set up the common motivations with dangerous things like fighting/fleeing/dying/wounded. Our market will feel dramatically different if you put "Orphans - Begging" as a Very Common instead of an Uncommon. 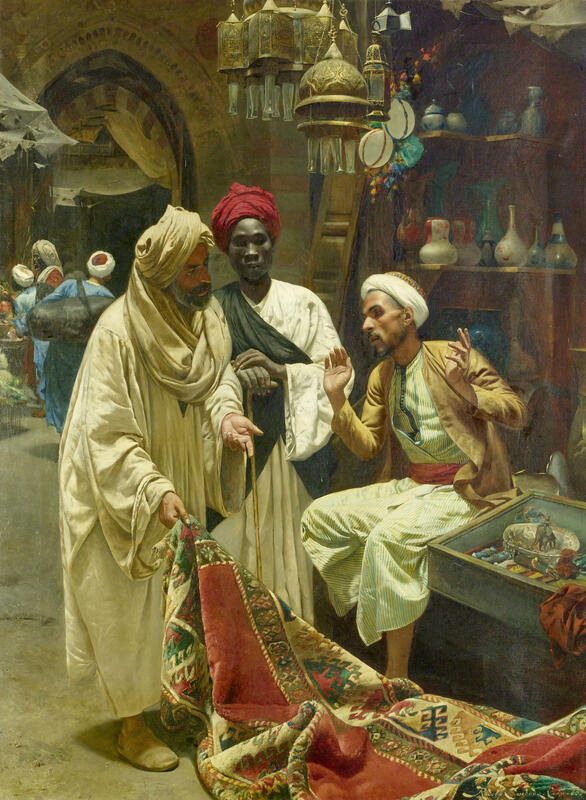 Likewise "Guards - Patrolling", "Apprentice - Delivery", "Merchant - Hawking", "Bard - Art/Performance" can totally change the feel of the market if you put them in the very common spots. Motivations associated with NPC movement add hustle and bustle to the world (everyone comes and goes so quickly), while positionally fixed NPC motivations will give you the feel of moving through an area. An encounter's position on the chart changes everything and this is one of the main reasons I think it's good to think about the location thoroughly before you start on this table. And don't forget your symmetry! If you're writing up a port town, sailors and prostitutes seem like a good thing to put in symmetrical positions. I'm also of the opinion that named NPCs should NOT be included on the encounter table. Keep them as a prop and play them when they need to be played. Curate the randomness a little. Perhaps it's bad that this example was a marketplace, but it works just as well for dungeons, and coherent parts of dungeons. With this system all your monsters are wandering because all of them have stuff to do. They have a reason for existing and that reason doesn't inherently have anything to do with the player characters, and to me, that's fantastic. I like this. You seem to have really similar notions to me when it comes to what I want from an RPG setting book.